The 'Line of Kings' is the permanent exhibition in the White Tower. 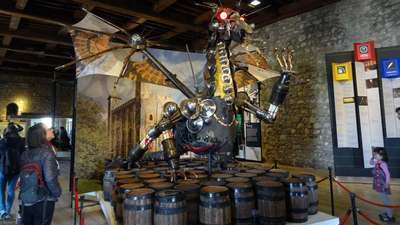 It presents a large collection of weapons and armor that were made during the centuries in England, but also that were taken from the enemy, or that were used in the various countries of the Commonwealth. 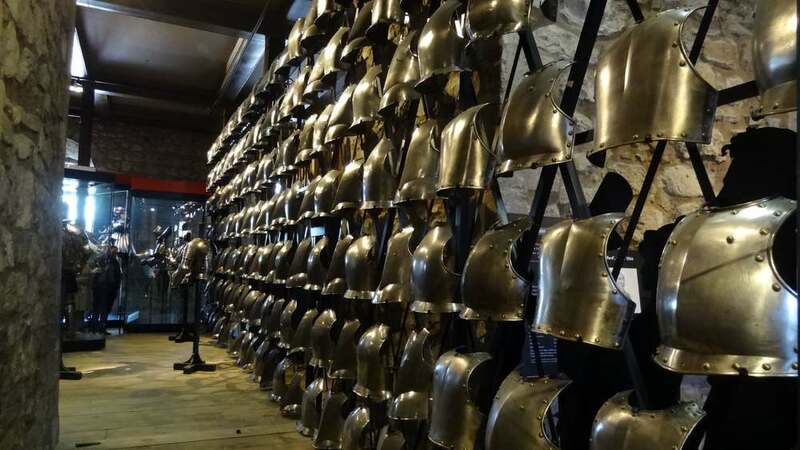 It is a very interesting museum where models wearing armor in situation, even on horseback, and games for children, are mixed, for example to test its strength when bandaging an arch. 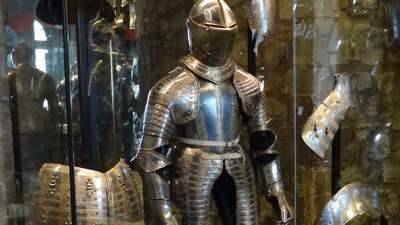 The collection of weapons and armor presented in the Tower of London is really impressive, even for those not interested. In the succession of large halls that characterize the white tower the visitor crosses several themes. The main one is armor. There are many, mostly presented on mannequins. Some are presented with a horse, also harnessed metal for its protection. The most striking are the finely chiselled armor of gold, which is generally the property of kings. Weapons are also quite numerous. There are English arches, a particularly popular weapon of the British who knew how to improve it during the centuries to make them almost as efficient as modern firearms. There are also many weapons from Commonwealth countries, such as Hindu swords, Maori weapons, arborigenous boomerangs, and even the ornaments of the feathers of Indian chiefs. Most weapons are later than the 15th century, especially swords. The second floor is more devoted to more modern weapons, such as first muskets and other handguns. On the contrary the ground floor is devoted to canons, whether English or taken on their enemies (especially to the French, yours ...) Note that for canons the Tower of London presents many pieces of size and of different epochs everywhere. At the entrance to the Waterloo barracks (the most modern), along the Rue de la Rive (the most imposing), at the feet of the white tower (the most decorated), etc. 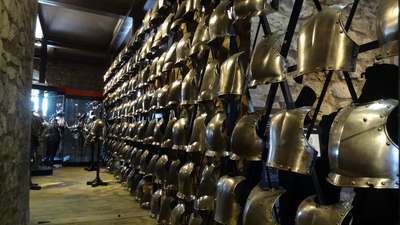 It is on the 1st and 2nd floors that the collections of arms and royal armor of England are found. The oldest date back to the time of Henry VIII. Before that time the English armor was fairly primitive. 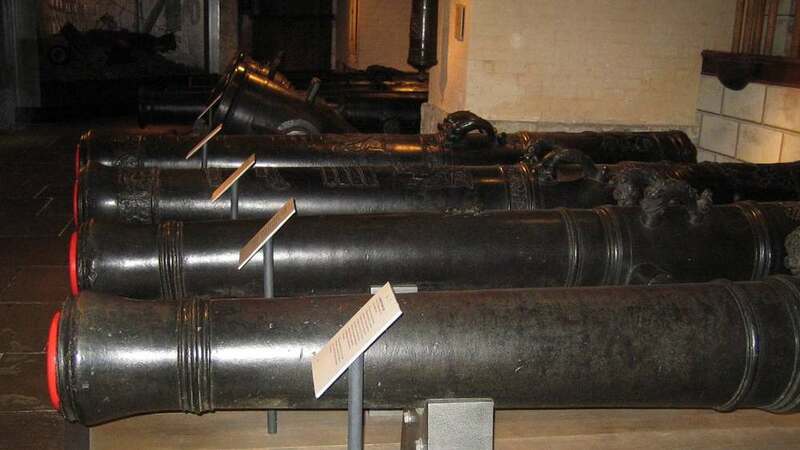 The weapons were usually made at the Royal Greenwich Arsenal but kept in the Tower of London. 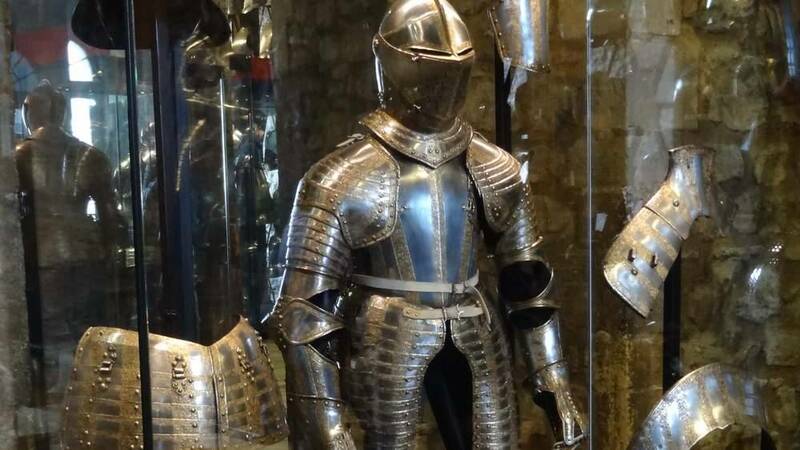 While the first inventory of royal armor was made at the death of Henry VIII, it was not until 1660 that the Arsenal in the White Tower began to exhibit a part of it as a museum. It was, for the time, relatively innovative. Most of the surviving armor from the Tudor and Stuart kings is shown here. 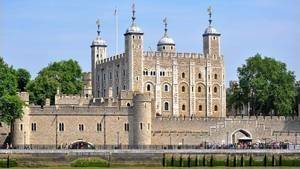 By 1600, most of the white tower had been built as an arsenal. Ironically, the use of armor decreased considerably during the 1600s. Nowadays the White Tower exposes the collection in chronological order, the oldest weapons being on the top floor. In fact the armor was little used by the infantry: it was heavy and expensive, and it made it difficult to fight properly. As for the equipment necessary to equip the whole of an army, it was so important that it was never manufactured. Only the nobles and rich people could afford to have one, it went with the horses needed to move it. Here is a list of some interesting pieces presented at the Tower of London. Note that the armor of Henry VIII below is only one of many armors he possesses in life: One can see another, towards the end of his life, at the Metropolitan Museum of New -York. This showcase shows a quest scene. The character has a complete armor of very good quality. It was undoubtedly given to Henry by the Emperor Maximilian, it is minutely engraved with ornaments, for example the hem of his "skirt" is of very high quality. It was designed to swing with the horse because, too heavy and too rigid, both made. 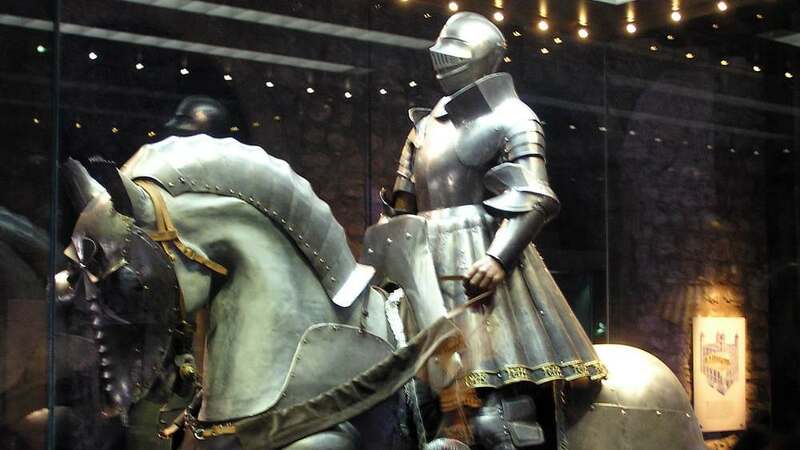 The armor of the horse was probably made in the workshops created by Henry in England using the craftsmen he borrowed from Maximilian. Besides its defensive aim, this armor is a real work of art with engravings based on the drawings of Hans Holbein the younger, his court artist who died of the plague while painting the portrait of Henry. The corpulence of King Henry VIII having changed during his reign, his armor had to change also, becoming wider and wider. This set presented here has a 54 inch chest size. Henry was 49 when it was made. This armor weighs about 80 pounds. This may be a good defense, but it is probably too heavy for Henry who could not really attack with. The armor of Charles I is of great finesse. It denotes others by its modernity, it is one of the last armors constructed, the feudal time being largely outdated. This armor was made for Charles I and Charles II in the middle of the nineteenth century, in 1854 exactly. It is finely chiselled with gold. 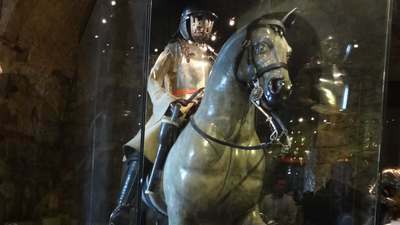 The armor of James II is now presented on horseback, in situation. For a long time she had just been upright. If the general shape of the armor is simple, very simple even, it is the mask in front of the face that is particularly worked, with horses nose-up. The upper floor of the Tower of London also contains a display of barrel gun barrels. This set reminds us that the white tower was for a long time the largest ammunition store in England. By 1667, nearly 10,000 barrels similar to those on site were stored here. It was huge! 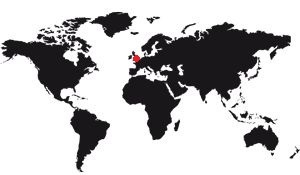 Given that the Great Fire of 1666 London stopped just in front of the tower, the British understood that they had just escaped a disaster and began to move this volatile mixture elsewhere. It was a wise decision because the white tower was already beginning to receive the first documents of the National Archives. 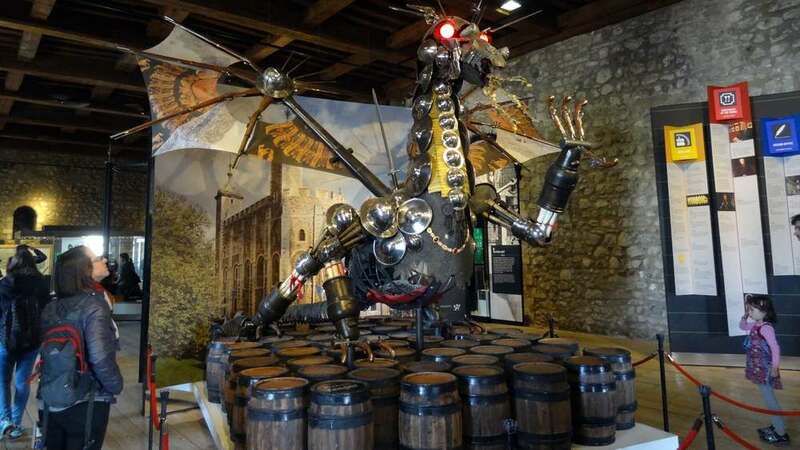 Nowadays the barrels are presented surmounted by a metal dragon, a very original metaphor to mark the firepower of the Tower of London. These armors are presented in the form of a wall. Their large number evokes the number of soldiers who carried them, over time. This is partial personal protection. Indeed, England never developed a plan of armor equipment for all of its soldiers, who thus fought lowly protected. These chest protectors were already good elements, and they had the advantage of being much less heavy than a full set of armor. The Armor Room is in the southern part of the White Tower. It is filled with complete armor, which has been borne by the kings and knights of England, and which are arranged so as to represent them on horseback, and armed from all parts. At the feet of each figure there is a banner bearing the name of the knight represented. This armor is composed of a haubert or chain mail, with its breeches and its hood. Ancient spurs: sharp points; without knobs. The king wears a breastplate with sleeves and basques of mesh. He holds in his hand a large ax of arms. The spurs are remarkable for the size of their branches. The helmet is surmounted by a lion. Tournament armor. It shows all the pieces of a complete armor: the cuirass, the helmet, the collar, the armbands, the gauntlets, the leggings, the legs, the sollerets (iron shoes), the guard, the flying piece , etc. This figure holds a spear in his hand, and on the breastplate of the cuirass is seen the falcon, or hook intended to support the spear in a stop. 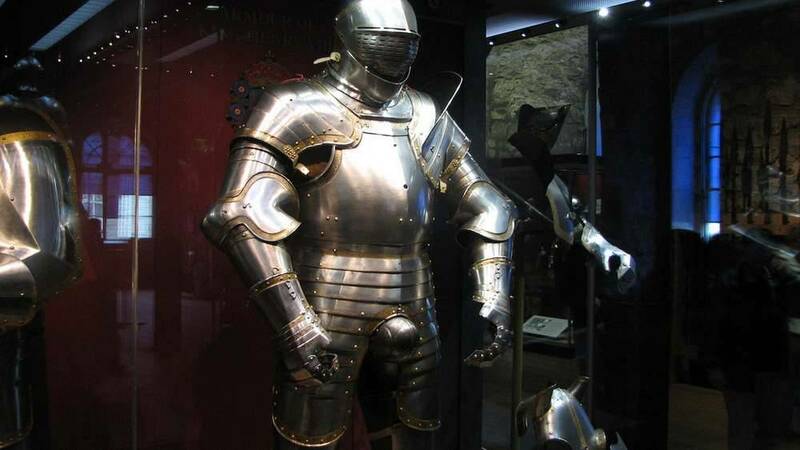 It is a richly worked armor. She was taken to the tournament of the Earl of Eglinton in 1840 by the Marquis of Waterford. Note the construction of the pedes terminated in spikes of an excessive length. It is a fluted armor. 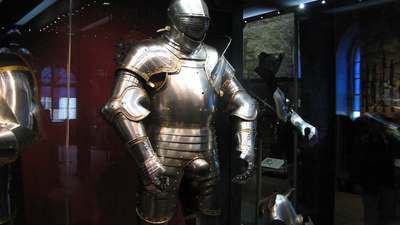 This type of armor was introduced towards the end of the fifteenth century. A sword in his hand. A small ax of arms is hanged on the pommel of the saddle. The shape of the pedals has completely changed. Armor of polished steel, damascened in gold. To the right he bears an iron hammer, with a long sword at his waist. The chest of the horse is decorated with various figures, among which are the rose of England and the lily of France. This harness resembles much that of Henry VIII. It is polished steel. This armor is gilded; and the pieces of which it is composed do not differ much from the two preceding ones. One should notice the "mainfer" (hand of iron), kind of gauntlet, that this figure carries. A mass of weapons in the hand: a sword at the side. It is a superb armor, damascened in gold, and of fine workmanship. The armor of the horse is adorned with the currencies of Burgundy and Granada. It is believed that it belonged to Philip, Count of Flanders, son of Mary of Burgundy, who married Juana, daughter of Ferdinand and Isabella, the victors of Granada. Beautiful golden armor. This figure bears a rapier, and the sollerets are of a curious construction. It's a tournament armor. On the chamfer of the horse is seen the design of a bear, an emblem which figured in the arms of this knight. He was Champion of the Crown during the reign of Elizabeth. This armor was formerly shown as that of William the Conqueror! 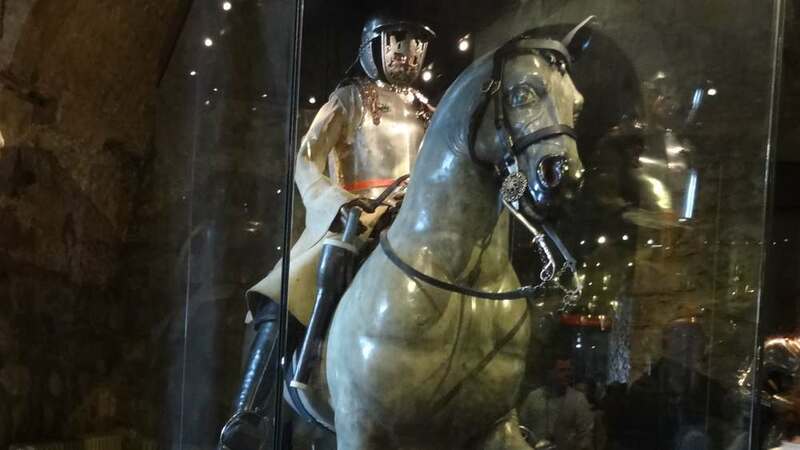 Here we must stop, to look into the right-hand recess, an equestrian figure of King Henry VIII, clothed in a very fine armor, which is engraved on all the surface of subjects taken from the legends of the Middle Ages. Among the ornaments there are the currencies of the house of Tudor intermingled with those of Aragon; it is therefore probable that this harness was made for the king on the occasion of the festivals which were given to celebrate his marriage with Catherine. Between the sink and the front door. On a pedestal, an armor six feet high, which is said to have been made for Henry VIII, then 18 years old.